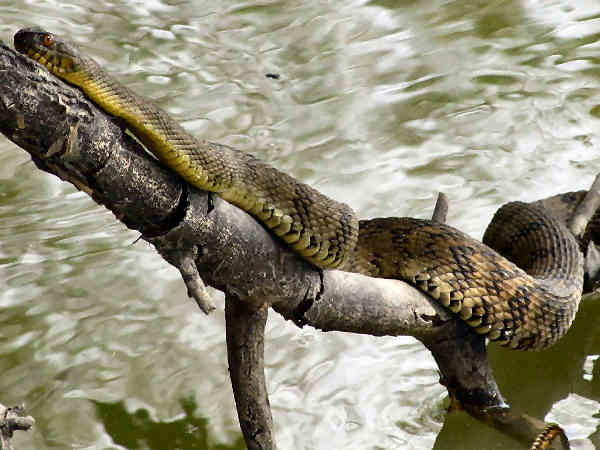 Situated near large waterways helps with Indiana snake diversity. Of the thirty three Indiana snakes four get tagged as venomous snakes. They are the common venomous snakes of the United States, copperheads, cottonmouths, rattlesnakes and Massasaugas. Copperhead snakes are more common than the cottonmouths. Both can only be found in the southern end of the state. Timber rattlesnakes also have a southern range. Indiana snakes in the Colubrid family are presented in this section. Due to space limitations only a representative sample are provided. Please press the snakes button for additional snake pictures and information. Eastern Hognose snakes (Heterodon platirhinos). pictured at the top of the page, can assume a variety of colors and are while they have a potential wide range across Indiana, they are still a fairly uncommon species. With three recorded species, Indiana snake diversity can be said to extend to the popular Kingsnake and Milk Snake genera. 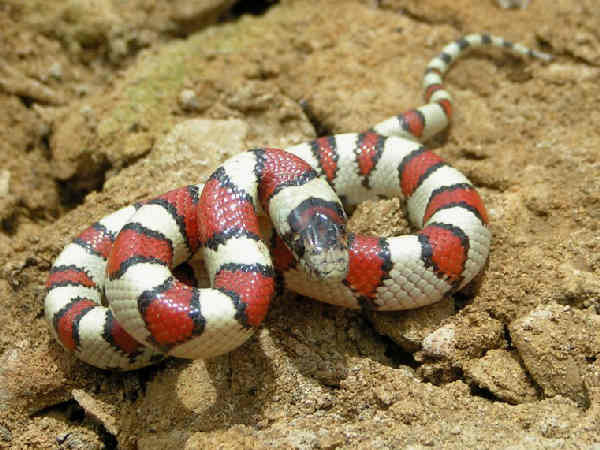 The state’s Eastern Milk Snakes (Lampropeltis triangulum) are very adaptable snakes and almost as widespread as the state’s garter snake population. The Red Milksnake (Lampropeltis triangulum syspila) another subspecies, takes over a territory in the southwest corner of the state. Three watersnake species call Indiana home. Diamondback Water Snakes inhabit southern areas of the state. Two subspecies of Northern Watersnakes (Nerodia sipedon) range across most of Indiana. 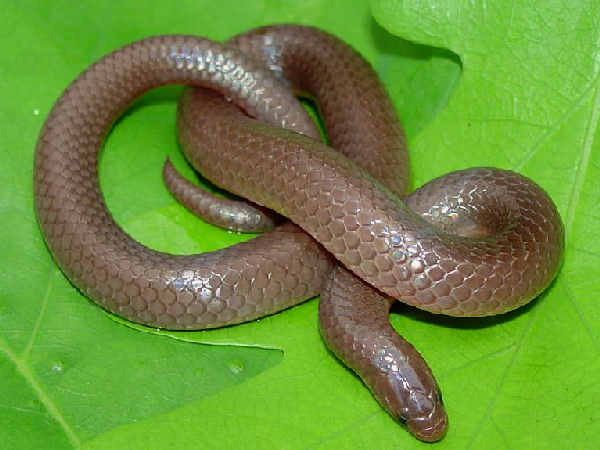 Plain-bellied Watersnake (Nerodia erythrogaster) or Copper-bellied Watersnakes are listed as endangered. They are found in only two counties. A two tone dark top and orange-red belly makes it easily distinguishable from the Diamond-backed watersnakes in their territory. The Eastern Ratsnake, aka the Black Ratsnake ranks as Indiana’s largest snake. Their woodland habitats can sometimes include heavily wooded residential areas. It sometimes comes as a surprise to unsuspecting homeowners to see a six foot snake climbing up their tree. Fear not. They are not aggressive. Their rodent based diet means they are a beneficial visitor to any neighborhood. A lack of rodents in the neighborhood also means the snake will just be passing through to a territory that better suits its dietary needs. 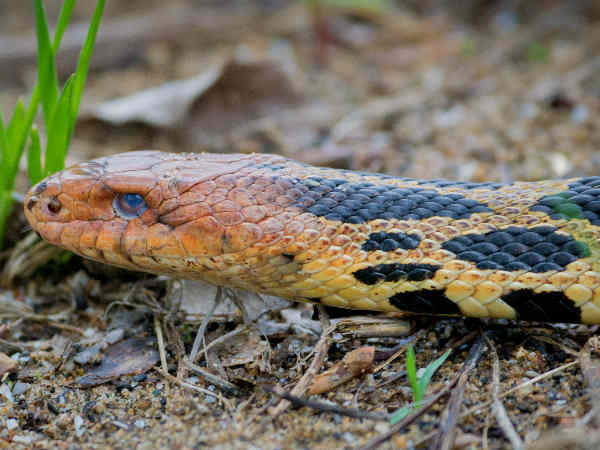 Indiana also hosts another species in the Ratsnake family, the Eastern Foxsnake (Pantherophis gloydi). They can grow almost as large as the Black Ratsnakes, and have a brown patterned body. They live in the northwest corner of the state. 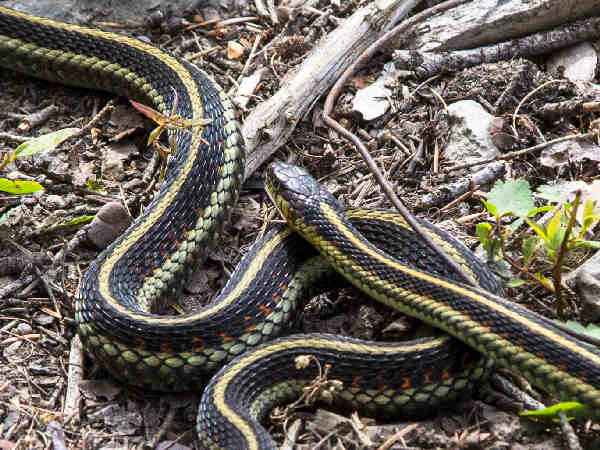 Indiana residents often think gartersnakes when they think Indiana snakes. 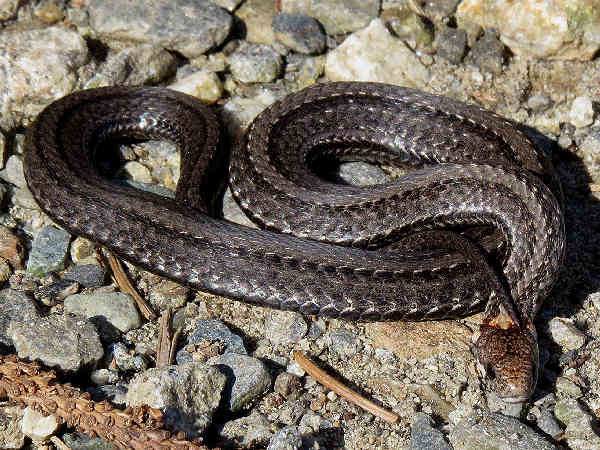 These are the comparatively small (two feet) and thin, striped snakes that inhabit residential areas around the state. In fact, Indiana hosts five different species, albeit with each having different population levels. 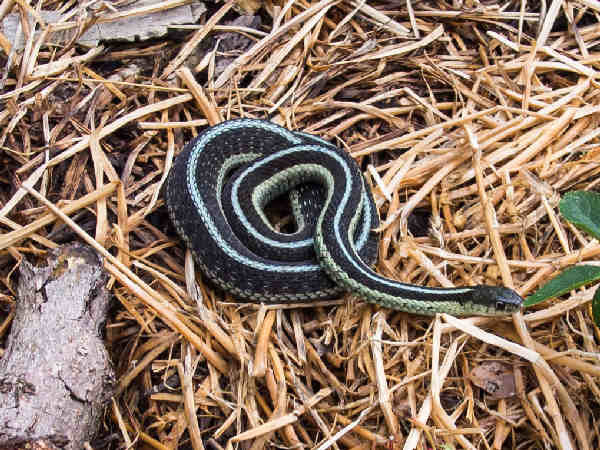 Eastern Gartersnakes (first picture) are the most common species. They are also habitat adaptable and live in less populated areas including fields and forests. Often they can be seen swimming in slow moving waters. For comparative purposes the second picture shows the Butler’s Gartersnake. It’s not so familiar in the neighborhoods because it prefers open habitat. Indiana hosts two storeria species. 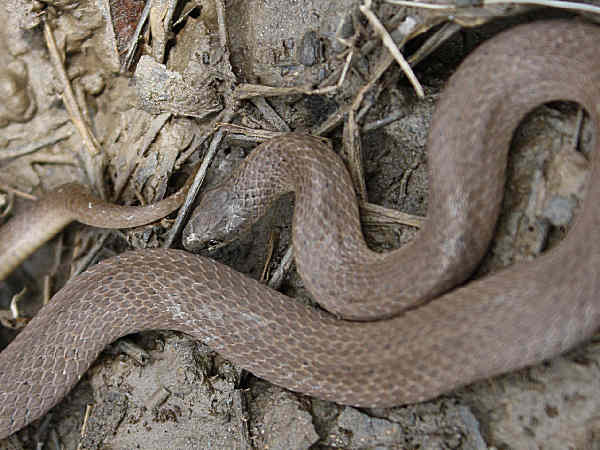 Dekay’s Brownsnake (Storeria dekayi) is a foot long snake that lives in fields, forests and backyards. Red bellied Snake (Storeria occipitomaculata) are also around a foot in length, and they live mostly in wooded areas. Eastern Wormsnake (Carphophis amoenus) is a very small and thin snake that inhabits forested areas in most parts of the Eastern United States. 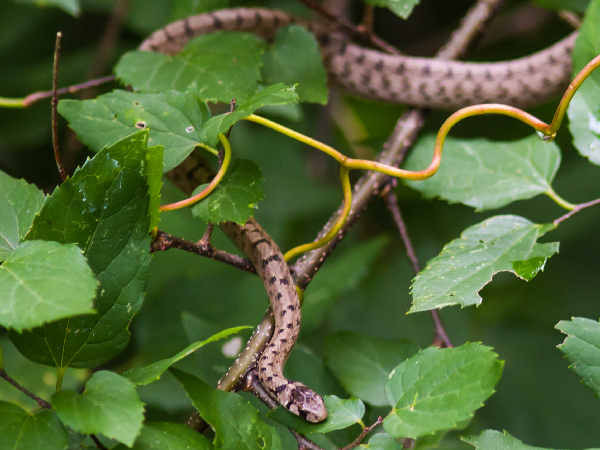 Smooth Earthsnakes (Virginia valeriae) are the only representative of the Virginia genera. They are fairly common in the East and easily recognized by their smooth brown body. 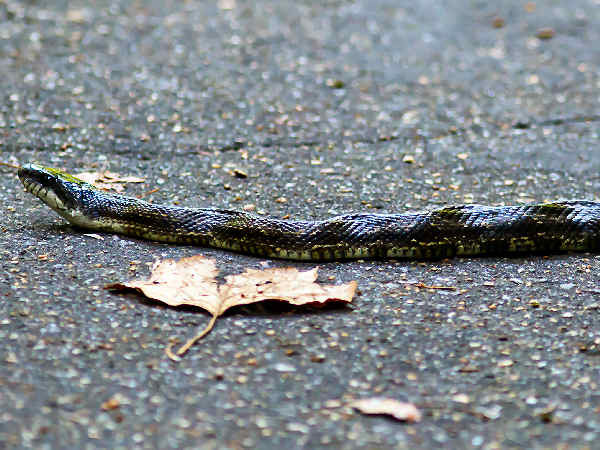 Eleven species of Black-head Snakes have been recorded to date in the United States. They are all regionally based and all but three species have some type of connection with the Southwest. A dark of black head contrasted against a different color body is the physical characteristic tying all the species together. 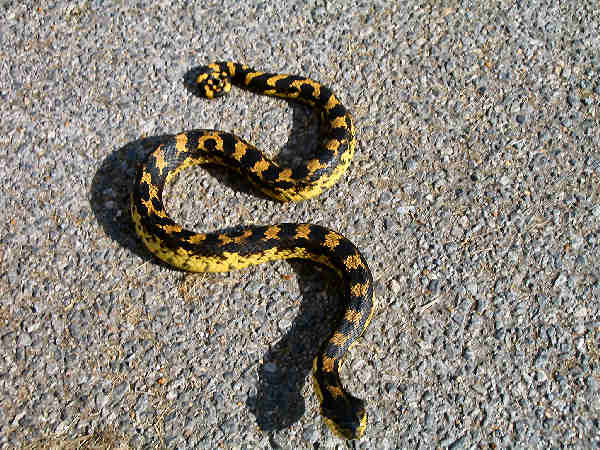 The Southeastern Crowned Snake (Tantilla coronata) is endangered in the state. Here’s another quick list of the state’s remaining snake species.